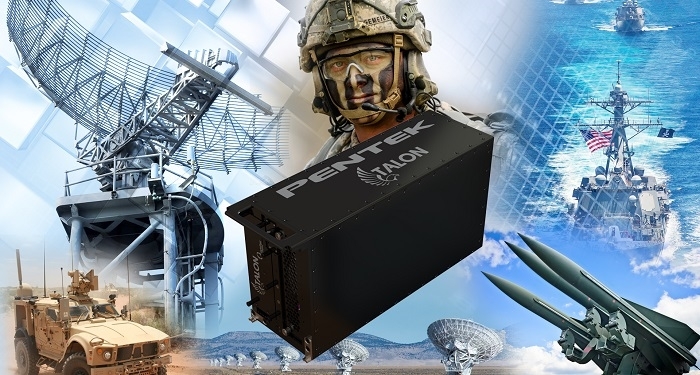 Pentek has introduced a new high-performance small form factor (SFF) recorder product line for extreme operating environments. The recorders provide real-time streaming data rates up to 4 GB/s for multi-channel, wide bandwidth RF signal recording. An addition to the company’s Talon RTX 25xx Series, the new rugged sealed ½ ATR recorders, Model RTX 2590, are optimized for SWaP (size, weight and power) and are available with multiple input options and up to 30.7 TB of removable SSD storage. The Model RTX 2590 provides eight phase-coherent 250 MHz 16-bit A/D channels, for recording up to 100 MHz of RF/IF signal bandwidth per channel with excellent dynamic range. It can sample RF/IF signals up to 700 MHz and provides digital down-converters with output bandwidths selectable from 5 kHz to 100 MHz. Engineered to operate in the toughest environments with high levels of shock and vibration, the RTX recorder's chassis keeps all electronics sealed from the external environment. The ½ ATR chassis uses military standard circular I/O connectors to control RF emissions while protecting the recorder's electronics from humidity, water, dust, sand and salt fog. The Talon RTX SFF chassis further seals the internal electronics from the outside environment by extracting heat through conduction to an air-cooled inner plenum. A thermostat-controlled, removable fan pulls air into the front of the chassis, through the plenum and then out the back of the chassis. Only the fan is exposed to the outside environment, assuring all system electronics are protected in the sealed chassis. The inner plenum can be replaced to provide other cooling options, such as liquid or conduction cooling. Designed to operate from -40ºC to +60ºC, these recorders can handle most thermal environments, making them ideal for UAV's, aircraft pods, tight equipment bays, military vehicles and most outdoor environments. Pentek's QuickPac drive pack is easily removed from the recorder via a set of captive thumb screws on the front panel. An empty QuickPac drive pack can replace a full one for short down times and extended missions. A companion offload system for the drive pack is available so the recorder can be redeployed while the recorded data is transported and reviewed via the offload system at a ground facility. The QuickPac drive pack holds up to 30.7 TB of SSD data storage and supports RAID levels 0, 5 or 6. For secure applications, a separate operating system drive can be removed, allowing users to extract all non-volatile memory from the system in just a few seconds. The Talon RTX 25xx series recorders with the Intel Core i7 7700K, 7th Generation Quad Core 4.2 GHz processor and 8 GB DDR4 DRAM, are expandable to 16 or 32 GB with enough processing power to act as the primary mission computer when needed. Utilizing the processing power adds slightly to the power budget, but delivers state-of-the-art processing for mission applications and control. Pentek's SystemFlow software interface is integrated into every Talon recorder. The software includes the graphical user interface (GUI) that is used to control the recorder with point-and-click configuration management, a client/server communication interface. NTFS file system support and an application programming interface (API) for custom user applications and control. Signal analysis tools include a virtual oscilloscope, spectrum analyzer, and spectrogram to monitor signals before, during and after data collection. The system can be controlled remotely via the Gigabit Ethernet interface available on one of the MIL-STD circular connectors.